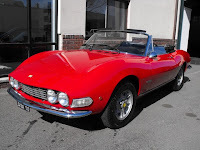 1967 Fiat Dino 2.0 Spider - These are not Fiats with Ferrari engines dropped in them, nor are they Ferraris built by Fiat. The Fiat Dino is a car unique unto itself. Instead of writing a brief history of the Fiat Dino, I'm going to point you to the Ritzsite.net article about the car. It's an incredibly well written and detailed article. Click here to find it. It wasn't very long ago that really nice examples of these cars sold in the mid $20,000.00 range. Not anymore. The car listed on eBay, with a claimed 21,000 miles on it and a recent $40,000.00 restoration job, has an asking price of $59,995.00. At first that seems like a fairly high price, but lately I've seen several lesser examples selling for $35,000.00 or more, so who knows? It seems like people are finally figuring out just what these cars are and just how rare they are. Click here to see the Craigslist ad for these cars. Datsun 1600 (311, Fairlady) - I recently wrote a post about a 1968 Datsun 2000 (click here to see it). The 1600 was its predecessor. It's similar to the 2000, but has a 1600cc engine and some minor design and trim differences. The car listed on Craigslist is a nice restored driver. Located in Santee, CA, click here to see the Craigslist listing. This listing has ton of high quality pictures. It takes some time to load. 1985 Maserati Biturbo - I wrote about this car last year. You can click here to see the post. It's back on eBay. From the pictures and description, it seems like one of the nicer Biturbos around. As I wrote in the past, Biturbos are cheap to buy but not cheap to keep. They require a lot of maintanence. However, once they are sorted and running properly, there few cars in this class that are as much fun to drive. Click here to see the eBay listing for this car. 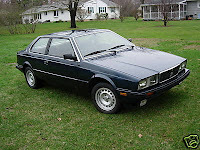 (Another) 1985 Maserati Biturbo - This one is not quite as nice as the one shown above, but it's in respectable condition, needs a little work, and is cheaper. I'm posting it because it's located in the town where I live. It's a tiny New England town and I've never seen this car driving around, but it would probably take me all of 3 minutes to locate it. I've always wanted a Biturbo. I just can't think of a worse time for me to start a new project. This is tempting though (no shipping fees, being able to look at it and drive it before committing to buy, etc., etc.). Somebody please buy this and save me from myself. Looks like both those Masteratis sold. You're safe! Unless you were one of the buyers... In which case, good luck! Nope. I didn't buy either one. I'm glad they sold. If the Dino didn't have the Fiat name on it it would beselling for 80K!